I thought I bought mustard, but when I put it on a hot dog and ate it, it didn't taste like mustard. It irritated my nose and sent a shockwave through my skull. So I bought a different brand, but there was not much difference. I feel that irritating, tingling sensation rippling through my head whenever I take a bite. I think it's yellow mustard, the label says "table mustard". I don't recall having this reaction when eating mustard from McDonald's. As a straight answer to "why" it's the quantity of mustard oil in any given mustard type. There are many types of mustard, but the two you may find the most confusing visually are English & American. Though both are a fairly bright yellow in colour, that's about as far as the similarity goes. Mustard seeds themselves come in many different 'heats' - the mildest generally being pale yellow, almost white & the strongest are dark brown. Additionally, mixing mustard with vinegar tempers the heat & lengthens the shelf-life. Mixing instead with pure water increases the punch, but the flavours will dissipate over a much shorter period. American mustard is one of the mildest available. It starts with a mild seed, pale yellow/white in colour, but the colour is then boosted by using turmeric. The mixture is then diluted with vinegar. This is your 'standard' mild American mustard, found in many places, including McDonald's. You can slather it in huge quantities on a hot dog with no ill-effects. Almost at the other end of the scale [Chinese mustard can be even hotter] is English. Made with a mixture of yellow & brown mustard seed, then mixed with water not vinegar, this will take the roof of your nose out if used in injudicious quantities. It can quite literally make your eyes water & your nose run - though if you did it by accident, take solace in the fact that the hit is very short-lived, not like eating a blindingly hot chilli pepper. The full impact & flavour of English mustard is quite short-lived even in the jar, once made up from powdered mustard. Even ready-made, store-bought has quite a short shelf-life for a condiment. Made at home & mixed with water it will lose its punch in just a few days, so the trick is to buy powder & mix it just 15 minutes before you eat it, for the full experience. If you're ever uncertain visually which you are about to add - taste it first. Personally I love English mustard on hot dogs! With ketchup too [one of the only things I will ever put ketchup on]. The balance between the sweet, vinegary ketchup & the hard hit of the mustard is really quite the feast. Bring on the junk food! "English mustard" is also yellow and very very different from typical American yellow mustard as I've encountered it with hot dogs or burgers (French's, for example). A smear of something like Colman's (a typical hot English mustard) has about as much flavour as a spoonful of hot dog yellow mustard. What you describe is typical for when you think you picked up a mild mustard and it was actually a hot one. It's a mean trick we pay on foreign visitors in the UK (not deliberately). I suspect you're bought a similar product, though I don't know where you are. The heat is different to chilli heat, felt much more in your nose or sinuses than chillies. Dijon mustard is somewhere in between. A brand available in the US is apparently "Grey Poupon" (originally from France). The Wikipedia article on mustard has more details. If it is the case that you've bought something hotter than you expect, you can either use it sparingly or dilute it with something of a similar texture - mixing it with ketchup would work if you like both on your hotdog. Here in Germany, mustard is sold in a variety of "grades". The mildest variety is called "sweet mustard" or "Bavarian sweet mustard" (süß/Bayrisch süß), it is usually dark/brown in color and only roughly ground. Then come mild - medium hot (mittelscharf) - hot (scharf) - extra hot (extra scharf). These are usually (but not always) also finer ground. There is quite some variation in color from pale beige over yellow to darkish brown or even with a reddish tint. You can not conclude hotness from color, though. Also, while a few brands are specialized on some end of the hotness scale, many sell a wide variety, e.g. brand Löwensenf has products ranging from sweet and honey mustard all the way to extra strong and chili mustard. Bautzner goes from sweet to strong. And so on. Spicy hotness/pungencyy in German is called "Schärfe" (literally sharpness) and the same word is also used for images being in focus. 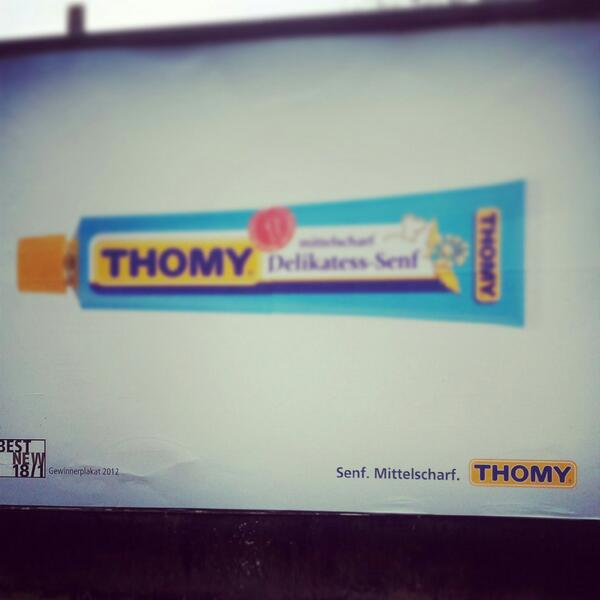 There was a IMHO really cool ad a while ago for medium hot mustard (Senf mittelscharf) with a slightly blurry (= not really scharf, only mittelscharf) picture of a mustard tube. Any type of mustard contains poisonous substances, as every plant, to protect it from being eaten by insects and other animals. Some people tolerate more, some less. It depends on ones state of health, specially if one has a lack of body fluid and other substances to cushion aggressive substances, it feels irritating. Not the answer you're looking for? Browse other questions tagged mustard or ask your own question. Is there a way to ferment mustard seeds for homemade mustard? What is the difference between whole grain mustard and regular yellow mustard? Why didn't my mustard sauce emulsify? Use yellow mustard to make mayonnaise?